I had lots of things I wanted to discuss with you today but I'm just going to let it blow over. I get wound up when things don't go so well with Ben, which is pretty much every day, but instead of hyperventilating I emailed some friends & I already feel better. There is nothing better than great friends, even when they're on the other side of the planet & a million timezones away. Okay, I am going to complain about one thing. What the hell is this? 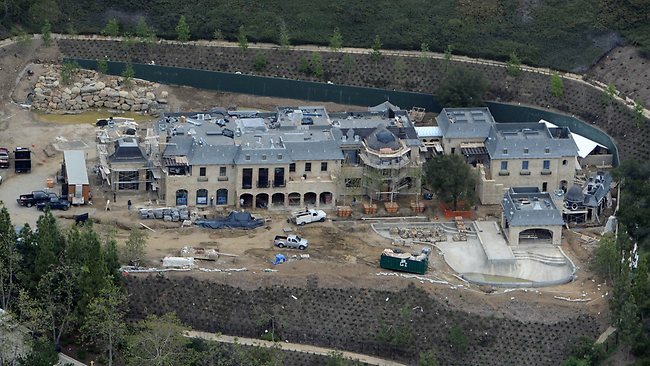 This monstrosity is the future home of one Gisele Bundchen. That's right, my arch-nemesis is going to be living in this house. I would post a shot of my own humble home as comparison but THERE IS NO ROOM LEFT ON THE PAGE! Girl needs to take her ugly-haired husband (they got married right?) & her own little Benjamin & just hide in this castle because I have had enough of her games. I will get you lady - whenever we move back to America, I'm sure we'll magically be in a financial position to move into your neighborhood. We may have to shack up in someone's garden shed but we'll be there with our Benjamin & we're going to be a whole heck of a lot more awesome than you. So there. Okay, I originally had the picture bigger but when I posted it, it cut off the right wing of the house. When I changed the size, suddenly my text was wrapping around it. I have no idea what I'm doing on this blog but I'm pretty sure a certain supermodel is hacking into my account & wrecking havoc with my settings. Too much time on her dainty, perfect hands! That is a massive house!? How can she possibly be that rich? What super nerd did she marry? She married an American football player, a quarterback named Tom Brady who has apparently won the Super Bowl a few times. Whatever. He WISHES he was a motion graphics editor. Hahaha you crack me up!!! !